It was never going to be an ordinary day. None of his days ever were! Ordinary days were for ordinary people. Ordinary people did ordinary things. Wandering around aimlessly on a deserted island was definitely no ordinary thing. Nor having a helmet on one’s haead 24 hours a day! He wore it even while sleeping and eating. The helmet was attached firmly to his head covering his entire face. 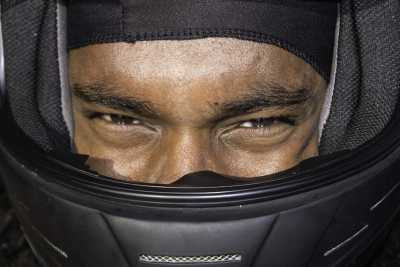 It was made in such a way that he could open the front visor only up to half way up his nose. Why had this been done to him? Was his face so grotesque that no one wanted to risk seeing it even on a totally deserted island? Dipesh had been an ordinary person all his life. Till that fateful day! He had studied engineering, loved cricket and was a software engineer. A description that would have easily fitted any of the hundred thousand young men in the country! But a letter had changed all that. The letter had looked quite innocuous at first. It was not the first time he was receiving something like this. But mostly these kinds of mails came by e-mail and landed in the junk folder. In the past he had won millions of pounds in lottery, received request to help princes in distress in African countries claim their inheritances and offers of juicy roles from some of the world’s top companies. He was not the one to fall for such scams. Only thing was this this time it was a snail mail and the contents of the letter seemed too far fetched even for a scam. Dipesh was tempted to tear up the letter and forget about it. But somewhere in his mind, something seemed to fit like pieces in a jigsaw puzzle. He had always wondered about the reason for his lack of family resemblance. Also his late uncle, his mother’s brother had worked for years at an oil company in Africa. So the Africa connection was somewhere there. He wondered if he should consult his parents. But if Bwanga had written to him directly, there had to be reasons. His mind sprang up a thousand questions. He just could not resist his curiosity and found himself at the dinosaur park the day following the next. The next few days had been a total roller coaster ride. Bwanga’s very looks and demeanor had something strongly convincing about it. When Dipesh heard the plight of the country's people, he had no second thoughts on what he had to do. The plan had been simple enough. It was supposed to be a straightforward person swap like so many twin brother Bollywood movies. But then at a high level most plans look simple. It is the details that tend to take on challenging proportions. For one he had just a single month to master the ways of the royal court. Then there was this matter of getting him into the troubled land of Bikerlandia. His foster parents had bid him a tearful farewell. They understood his sentiments and had not tried to stop him. Everything had worked as per plan and in a month he found himself a monarch. Not of a large kingdom, but a king nevertheless! Things had in fact worked too perfectly. Possibly this was not to the satisfaction of one gentleman called Murphy who had made a few laws that governed the affairs of men. So slowly things that could go wrong began to go wrong one by one following Mr. Murphy's laws. The monarch of the kingdom was also the head of the order of the knights of the Harley bike. The 15th day of Dipesh’s ascension to the throne coincided with the national bike festival. The king had to lead the knights on a day long bike procession around the country. But there was a small challenge: Dipesh did not know how to ride a bike. And Bwanga had not had time to teach him. But Bwanga as always was resourceful and had a solution for every problem. Instead of the king, a body double would replace him in the procession. But there was a small catch. For the plan to work the noble chief knight of the order of Harley bikers had to be taken into confidence. The chief knight Kuwangu had turned out to be an inflexible old patriarch who lived by the last letter of the rule book. The moment he heard of the deception, he totally refused to go with it. Bwanga had wanted to silence him. But the noble Dipesh would not have the blood of an innocent on his hands. Kuwangu had immediately blown the whistle. The original king was rescued from captivity and re-instated on the throne. Kuwangu was too merciful to have Dipesh killed. But an impostor with resemblance to the king always posed a threat to the throne. He would always serve as a trump card in the hands of any would be conspirators. So he had had the biking helmet affixed permanently to his head so that nobody could see the face that was a carbon copy of the king’s face. Dipesh was then been exiled to one of the remote islands on the pacific. He had eked out a lonely existence for close to a year. But today he was going to have company. A boat was seen nearing the island. It had landed on the island and a group of fierce biker knights got out. They did not have much difficulty finding him. Dipesh’s brother the tyrant had found out about him. He had had Kuwangu thrown in prison and had him tortured to find out where Dipesh was exiled. He had then sent out his knights to permanently end the threat to his reign. As the knight’s sword was about to feel the depth of his bowels, he let out a loud scream and things went dark. Next he was aware of someone shaking him. It was his mother. He was back in his bedroom in India. He touched his bosom. There was no wound. It had all been a dream. Phew! What a sigh of relief! The next morning was Saturday. He decided to stay at home and relax. The nightmare had felt all too real and he still needed time to recover from it. At 11.00 am, the bell rang. It was the courier man. He had come to deliver a letter and a parcel. A letter again! His mind was filled with anticipation as he opened the envelope. Thankfully the letter was not from any Bwanga of Bikelandia. Instead it turned out to be a pleasant surprise. It was a letter notifying that his entry had won a prize in the Castrol Power 1 Biker code contest. This had an immediate uplifting effect on his mood. Happily he opened the parcel to see his prize. As the wrapping came off to reveal the prize, he froze. In front of him lay an object he was had got too familiar with recently: a dark helmet!